Lost Levels :: View topic - Rollergames (NES, 1990-1991, Konami-Ultra) Prototype Screens Lost Levels - A website about unreleased video games. After 20 Years and more I discovered that on the Backside of the Game Box, there is an Screenshoot of what looks like a Testversion of Stage 3-1 (Automobile Processing Plant). It is different in the Player and Enemy Design and the environment has another Colors and Design too. Has Someone more Info on this Secret? There must (have) exist an Prototype of this Game somewhere. The Picture appear on the US and Euro Versions. Can Anybody look in the aviable Game-ROMs for remaining Data or Graphics? Or in Old Game Magazines? I found nothing on the Internet so far. "Video Games & Computer Entertainment - October 1990- Page 2"
that shows some Pixels more to the left and top but in poor Quality. Maybe on Japanese Websites there could be more about a Testversion of Rollergames, but the Game was not released in JP. This is a nice Game with good Music and nice Graphics. Yes, a "prototype" of this game existed at some point. EVERY game had DOZENS (hundreds? thousands?) of "prototypes" as it was being developed, that's just the nature of how games are made. You work on them until they're done, and you change things as you go. That doesn't mean that this particular build of the game was ever seen outside of Konami's offices, and more than likely, it was written over with a new build of the game as development progressed. And are we sure the shot isn't a mockup? The sprites seem a little more colorful/detailed. 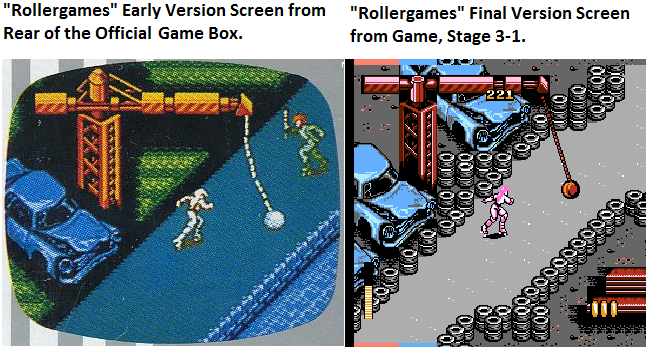 Posted: Tue Nov 03, 2015 10:06 am�� �Post subject: What is in the Rollergames NES ROM Data? There is an Fan made Portugese Version (Translation) by "Pobre" on the Internet as well. Can someone compare the ROMs Data for differences? There is still no Article on "TCRF" about this Game. Would be nice to know if there is something hiding in the ROM. I dont know how to get around with Software like "Tilemolester" etc. tried it but found nothing. The Photo is no Mockup, it is from Konami�s Rollergames Game Box Backside. It�s Original Photo (with others) may still exist in some PR-Archives. You can throw away every ROM aside from "Rollergames (Europe).nes" and "Rollergames (U) [! ].nes", since they're just bad dumps of the US version. That leaves you with only two versions of the game, European (PAL) PRG0 and US (NTSC) PRG0, which are not likely to have any differences aside from the publisher logo/text and maybe 60Hz -> 50Hz gameplay tweaks. If any other PRG revisions of the game exist (very unlikely), they haven't been dumped or documented yet. Also, "mockup" in this case means a fake gameplay scene manually assembled by the developer/publisher using actual game assets. These appear on game boxes all the time. 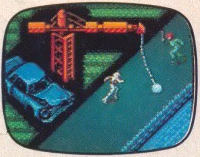 This is done either to depict a specific scene that would normally be difficult or impossible to capture, or because the area shown was not actually playable at the time.